Just ten years ago Downtown Cleveland was a tired and crumbling business district and a place to be avoided. Nowadays, it has transformed into a bustling centre for entertainment, theatre and casual dining. The grand banking institutions of the long-gone financial boom have been lovingly converted into food halls, restaurants and hotels. 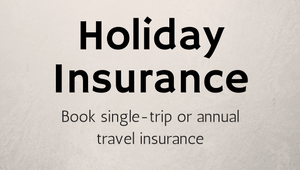 One such hotel is the Holiday Inn Express, which was formally the Guardian Bank Building built in 1894. 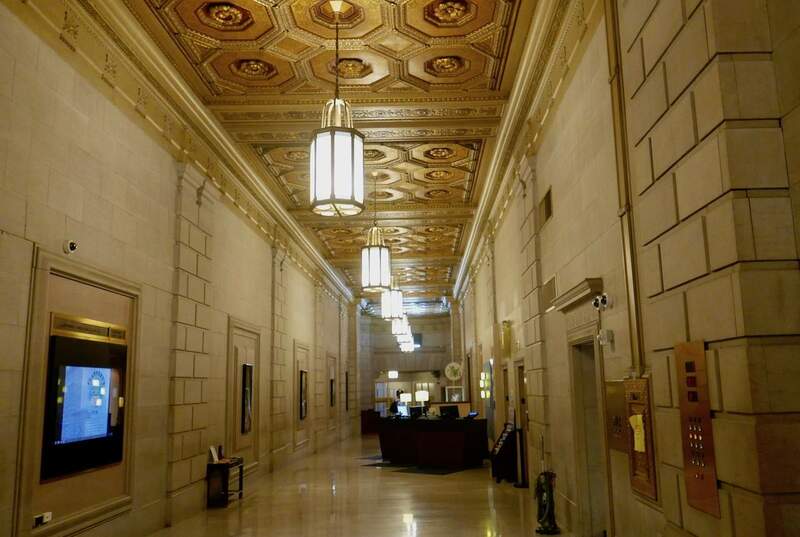 I was pleasantly surprised when I walked through the entrance for the first time to be greeted by a grand lobby with high ceilings and a wide, stonewalled corridor. This is an excellent base for couples, families and solo travellers wanting to experience a fun few days in Cleveland. Many attractions are in walking distance and there are plenty of restaurants and bars less than a minute’s walk from the hotel. Business travellers can make use of the 24-hour conference centre and excellent free WiFi. 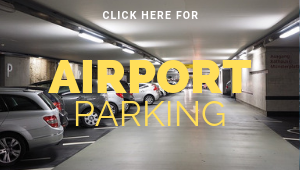 The hotel is also just a 20-minute drive to Cleveland Hopkins International Airport. Most of the 141 rooms at Holiday Inn Express are very spacious due to its former life as a bank. Expect high ceilings, wooden flooring and practical furnishings. While the decor is admittedly quite dated (my curtains resembled psychedelic frogspawn), rooms are very clean and the beds are comfortable. Some are also handicap accessible. Standard amenities include black-out shades, private bathroom, flat-screen TV with cable/satellite channels, coffee makers and a direct-dial phone. My bathroom contained an enormous bath with water jets, which came as a pleasant surprise. Toiletries are fairly basic (shampoo, shower gel, soap) but are replaced daily. There’s no spa or swimming pool at The Holiday Inn Express, but there is a small fitness centre (open 24-hours a day) with a couple of exercise machines. 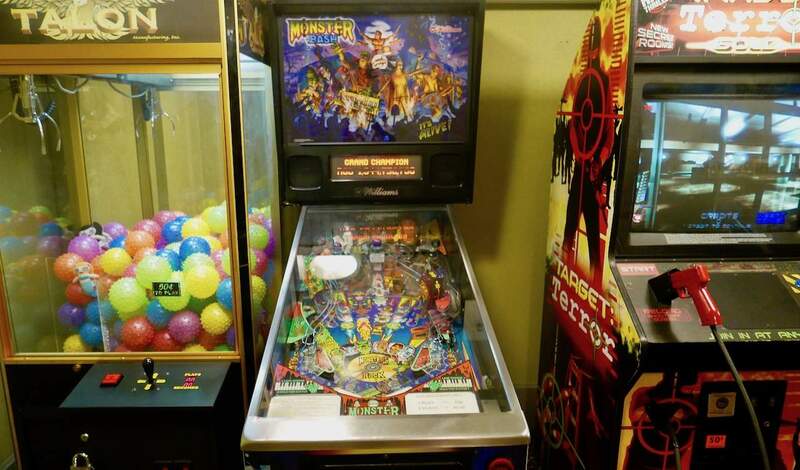 Some (especially kids) may enjoy the mini arcade centre with a pinball machine (popular in Cleveland), a claw game and a shooting game. There’s also a useful Machine where you can exchange dollars for quarters. There’s no free parking at the hotel, but there is a valet service that costs $24 per day. Apart from Mike & Dee’s Diner in the hotel lobby, there are no restaurants or bars here. However they do offer a free daily breakfast in the lower floor. 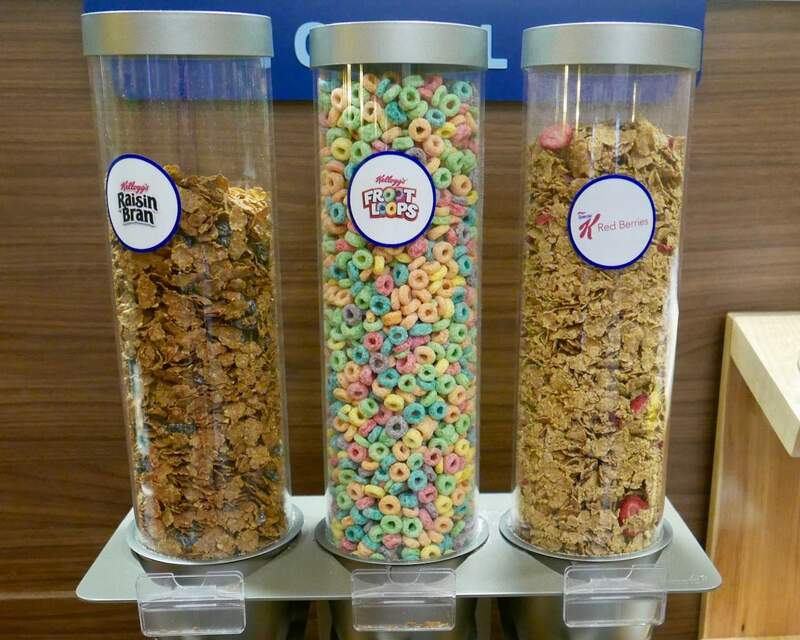 Tuck into a generous selection of cereal, fruit, pastries and even some hot options. There’s also a rather natty pancake machine that produces two fluffy pancakes at a push of button. The only drawback was the plastic cutlery, which wasn’t even able to cut though my pancakes and crispy bacon with much success. If you’re feeling peckish (or thirsty), walk over to East 4th Street and take your pick from the huge variety of bars and restaurants. Yes, WiFi is free of charge and easy to use. Prices start from around $80 per night including breakfast. Less than a five-minute walk from the hotel is Playhouse Square, Cleveland’s answer to the West End. There’s also a quirky shopping arcade which offers such gems as CLE Steampunk Shop and Cleveland in a Box. 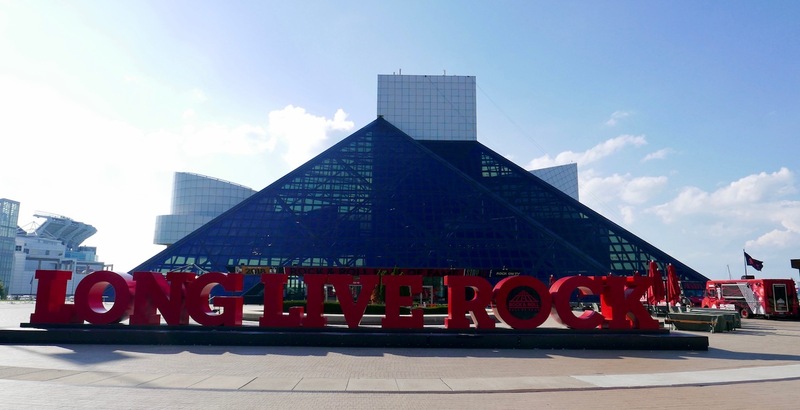 Further afield is the fantastic Rock and Roll Hall of Fame and Lake Erie (both a 20-minute walk), which doubles as the meeting point for Cleveland Bike Tours. If you’re travelling from the UK, Icelandair offer flights from London to Cleveland via Keflavík International Airport. Passengers are able to stopover in Iceland on their way to Cleveland for up to seven days for no extra fare price. The airline offers two classes of travel: A spacious Saga Premium with attentive service and Economy class with an impressive 32-inch seat pitch. 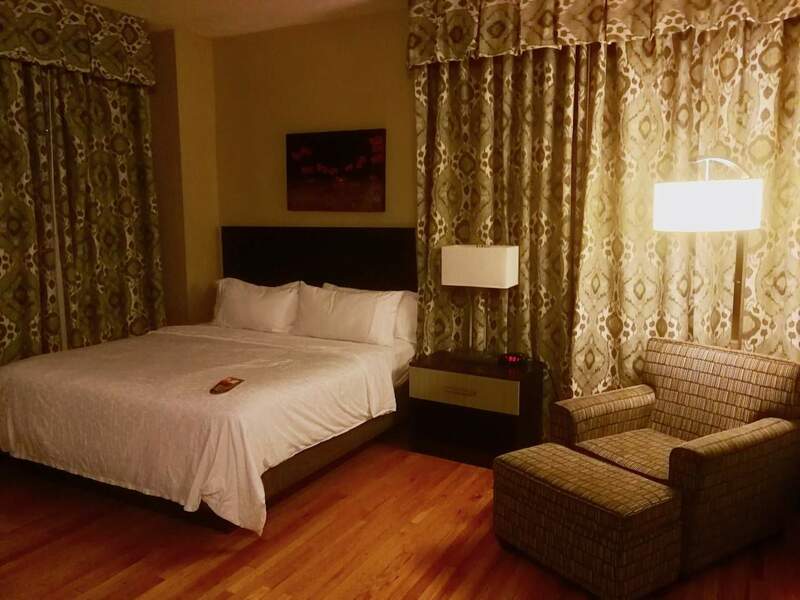 The Holiday Inn Express in Downtown Cleveland is in a fantastic location and offers great value for money. There may not be a spa or swanky amenities, but the rooms are comfortable and spacious and the building itself is surprisingly grand.